The distributed event tool, otherwise known as the "house party" tool, allows you to help your supporters build their own self-hosted local events, and for others to "meet up" with those local hosts. The friend-to-friend power of distributed events can greatly magnify your impact and build your supporter network, while delivering to those supporters an experience and personal connection that makes your cause much more than just another newsletter in the inbox. For example, while a single, organization-run showing of a film might cost a considerable amount and only reach a few hundred people, a distributed DVD shown by volunteers to their neighbors in hundreds of towns costs next to nothing and can reach exponentially more viewers. Additionally, allowing your supporters to organize at the local level offers a sense of empowerment to your supporters that will carry on well after the event. Creating a distributed event is a multi-step process that involves configuring separate pages to either build or search for an event, as well as configuring your own settings that will govern all the events your supporters create. To get started working with a distributed event, you'll need to navigate to the Distributed Events package and either create a new distributed event or select an existing distributed event to edit. Distributed Events are filed with the Events package in the Salsa headquarters. Depending on your account permissions and the size of your screen, you may need to scroll using the arrow buttons to find your "Events & Parties" tab. Select "create a new distributed event"
You will automatically be redirected to the screen where you can set up and edit the distributed event. See Step 2: Configuration. The name field provides an internal reference for you to identify the distributed event campaign; it is not shown on the user-facing pages. The word or phrase you choose here will appear in some places as end users interact with your pages, to make the language as appropriate as possible for the organizing experience you're aiming for. Apart from that language, the event type setting does not alter or restrict any other configuration options for either the distributed event's sponsor organization, or for the individuals who choose to host local events. Describe the purpose or highlights of your event. This description appears on the event page, and can be HTML-styled using the WYSIWYG editor, including images, links, and video embeds. You can request or require as much or as little information as you like of your new event's host. Salsa's default will be to request first name and last name, and require email and zip. 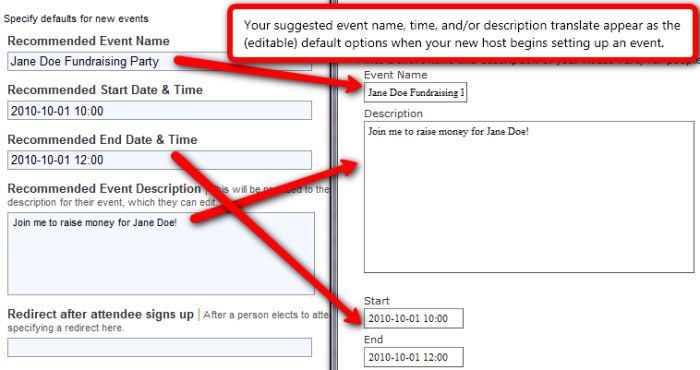 The information you collect about your event host will populate a Supporter entry for that host. 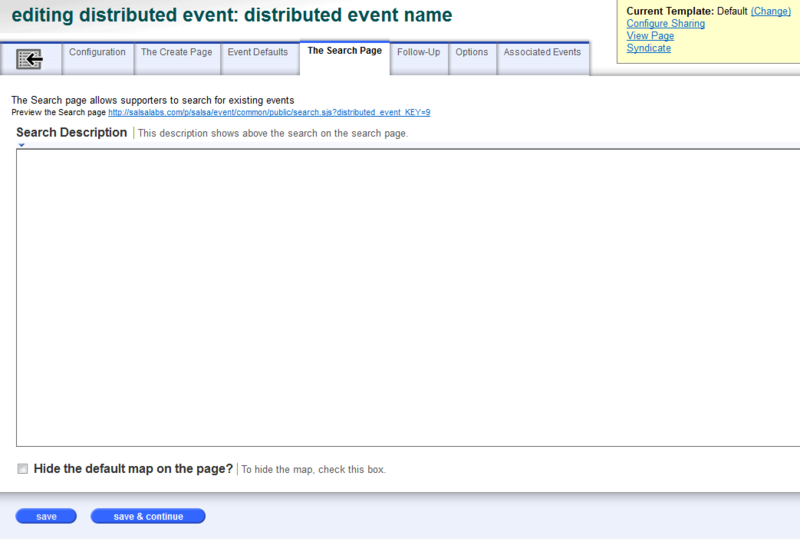 We recommend leaving this field blank, as Salsa will default to redirecting your event host to their new event's page. There, s/he can edit the event or launch tell-a-friend email messages to invite others to attend. This redirect page could be your website’s homepage, a donation page, a tell-a-friend page, or literally any other page on the web. You could even design a special landing page that tells the registrant to expect an email from your organization, or provides an event host welcome package. This field allows you to set the distance zoomed out on your map, ranging from street level to the entire world. The "create a page" option on your search page won't appear if the dates for your distributed event have passed. These dates can be set in the "Description" tab of your event. If a person tries to create an event outside of the valid date range, they will receive a red error message telling them to change the event dates to between the valid times. "Event Defaults" configure some settings that will affect the dozens, hundreds, or thousands of individual events that comprise your distributed events network. Though these fields are optional and can all be left blank, your they're strongly recommended and will help insure that your distributed event pages are "on message" through and through for both event hosts and attendees. Depending on your particular event objectives, these can be a valuable guide for your prospective hosts, many of whom will simply adopt your default recommendations. The names and descriptions those hosts designate will in turn be presented to potential attendees of the events; therefore, the organization managing the distributed event has the opportunity using the "Recommended" fields to exert message control throughout its network of events. After creating a new event, an event host will see a link to a tell-a-friend page which can help the host get the ball rolling by inviting friends and family. Optionally (but again, recommended), the sponsoring organization can provide a default suggested message by entering it in the "Suggested Tell A Friend Email Message" box. If populated, the suggested message will appear as the default, editable text for an event host using the tell-a-friend feature. The Search Page of a distributed event is a user-facing page enabling a potential attendee to look for a nearby event in the distributed event network. 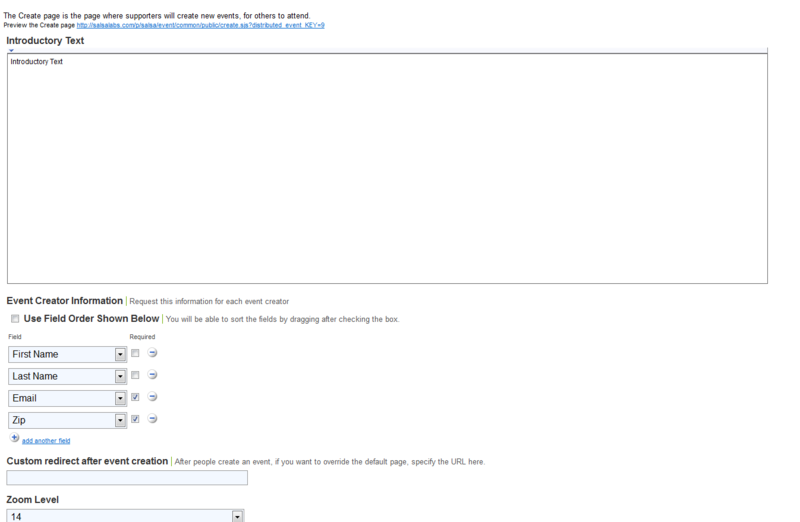 (See Image 1) The options in this tab enable the managing organization to customize the way the search page appears to supporters. This description appears on the event page, and can be HTML-styled using the WYSIWYG editor, including images, links, and video embeds. Hide the default map on the page? This map shows a maximum of 50 events, for bandwidth management issues -- showing hundreds of events would cause the page to load slowly and/or the map to become cluttered. Some of the individual events comprising large distributed events may not be visible in the map on the first load of the page. 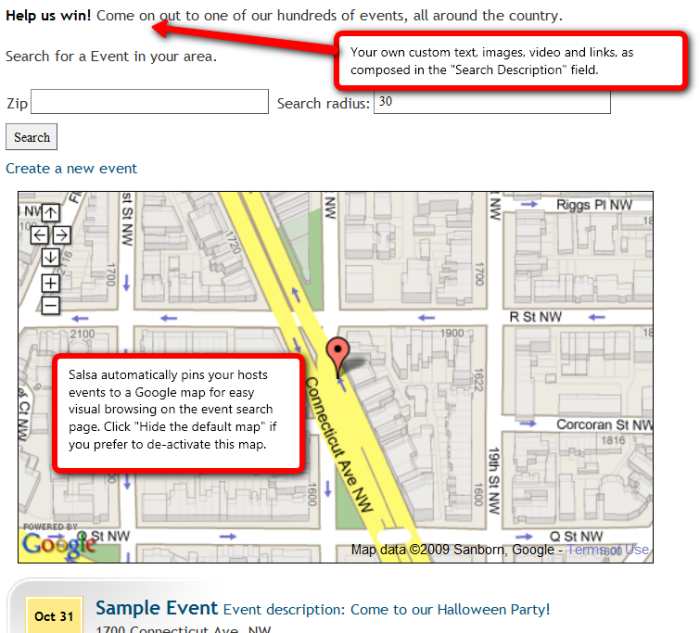 However, upon lookup through the zip code search interface, an entire set of local events will become visible. Checking this box suppresses the Google map display. Image 1: Potential attendees of your supporters' house parties will look them up on a page like this one. Image 2: This is what you will see in your HQ in the Search Page tab. Use the options in this tab to automate follow-up communication with email auto-responses. Auto-responses are email messages sent automatically upon completion of a page. Select one or more auto-responses to be sent when a host creates a new event. A follow-up timed trigger on a few days' delay asking if the host has everything s/he needs and offering a way to contact your organization for any personal help. 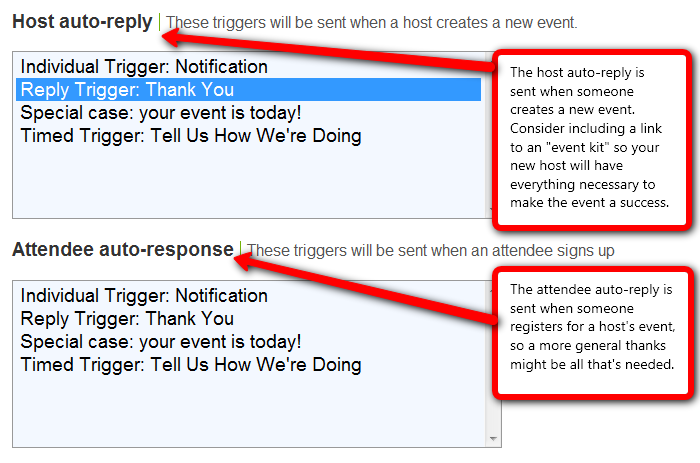 An individual trigger that notifies an appropriate contact in your organization any time a new event host registers. Select one or more auto-responses to be sent when an attendee signs up for someone's event. The Options tab offers a few less commonly used configuration choices. Most organizations can safely skip this tab, but these settings may prove invaluable for some specific needs. Do you want to require event confirmation? By default, any new event created within a distributed event can immediately be found and joined by potential registrants: it's public as soon as the event host that creates it hits "submit." For greater central control (at some expense in convenience), check this box to reverse this default. When "require event confirmation" is checked, new events will not immediately be publicly available until a human from the managing organization manually confirms the event is legitimate. To review and confirm events when this option is activated, go to "list events" (not "list distributed events") in your Salsa headquarters, and change the probationary event from "Unconfirmed" to "Active". Similarly, even if you do not require event confirmation, you can dis-confirm a listed event by manually changing its status to "unconfirmed", or "inactive". Optional help text adds a bit of text (HTML allowed) on the event creation page between the "Details for your event" heading and the user-entered fields that create the event itself. It can be left empty, or used for guiding the prospective host with suggestions (e.g., "Tip: For best attendance, host your event on a weekday evening sometime between 5 and 9 p.m."). The Associated Events tab gives you a quick glimpse at all the events your supporters have created that are associated with this distributed event. You can also make events searchable in your "Associated Events" tab by inputting the KEY for your event and then hitting save. Once you create an event, how do you publish it to your email list? Is this just setting up the information to be shown on a social media page or is it a webpage that is developed in Salsa that we then have to create an email to direct them to the page? Nowhere on the set up is there a SUBMIT button. The following steps can also be accessed by clicking here. 2) How do event hosts (the people who add a distributed event) manage and contact the event attendees?